Our Mosquito Control Exterminators will ensure you have A Mosquito Free Yard. We have the Know How To Get Rid Of Mosquitoes. Our Mosquitoes Exterminator will create a Mosquito Control solution to eliminate your Mosquitoes. Let Us be your Mosquitoes Extermination Company you rely on, Call Us Today. 1-844-305-8999. The infection, known as Zika fever or Zika virus disease, often causes no or only mild symptoms, like a very mild form of dengue fever. While there is no specific treatment, paracetamol (acetaminophen) and rest may help with the symptoms. As of 2016, the illness cannot be prevented by medications or vaccines. Zika can also spread from a pregnant woman to her fetus. This can result in microcephaly, severe brain malformations, and other birth defects. Zika infections in adults may result rarely in Guillain–Barré syndrome. Nearly everyone is affected by mosquitoes during the warmer months of the year. These pests swarm at outdoor events and breed prolifically in stagnant water--from bird baths to discarded tires--even puddles from the latest rainfall. 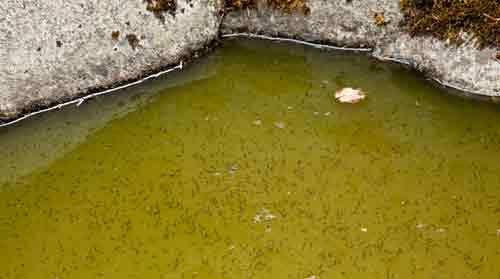 Certain land features, such as swamps, reservoirs and retention ponds are virtual breeding grounds for mosquitoes. And, all it takes is one tenacious pest to infiltrate your home and make everyone inside miserable. 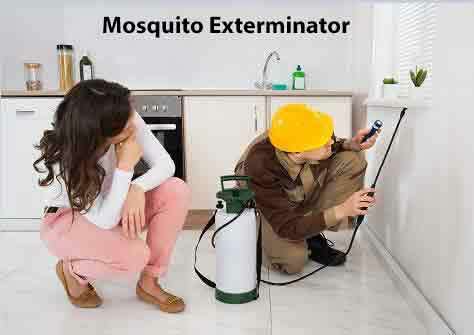 Mosquito Treatment: We remove and exterminate mosquitoes from your home. Our Mosquito Exterminators professionals are your Mosquitoes Extermination Experts. Give Dependable Exterminating A Call Today. 1-844-305-8999. Contrary to popular belief, mosquitoes do not require blood to live, as they feed on nectar. The males are not blood drinkers; however, the female of the species requires it to lay eggs. Once she lays her eggs, a female mosquito will seek more blood in order to produce more young. She will continue this cycle during her short life span of about two weeks. - After she obtains a blood meal, the female mosquito lays the eggs directly on or near water, soil and at the base of some plants in places that may fill with water. The eggs can survive dry conditions for a few months. - The eggs hatch in water and a mosquito larva or "wriggler" emerges. 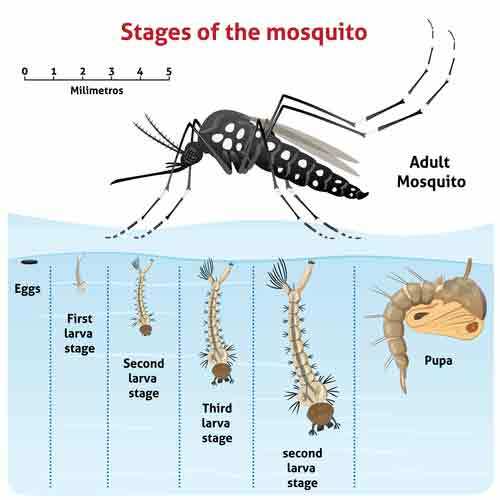 The length of time to hatch depends on water temperature, food and type of mosquito. - The larva lives in the water, feeds and develops into the third stage of the life cycle called, a pupa or "tumbler." The pupa also lives in the water but no longer feeds. - Finally, the mosquito emerges from the pupal case after two days to a week in the pupal stage. 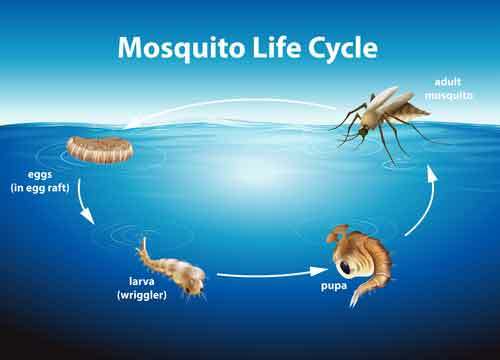 - The life cycle typically takes up two weeks, but depending on conditions, it can range from 4 days to as long as a month. A single bite can transmit diseases such as malaria, dengue fever, and encephalitis. The well-known and well-publicized West Nile Virus (an Encephalitis virus) first appeared in the Western hemisphere in 1999 and quickly spread to infect people in every state in the US. As a result, mosquito control is vitally important to human health and well-being. There are many varieties of mosquitoes, some of which carry more deadly diseases than others. Insecticide is often used on a wide-scale basis to combat mosquitoes and is generally very effective. If your property is prone to attracting and breeding a mosquito population, contact our professional Mosquito Exterminators to assess and manage the situation. 1-844-305-8999.